So you know an expecting mother and need a gift, but not something typical from her registry. Where do you start? With all of the options out there, things can get quite overwhelming. Let The Bump Studio give you ideas. We want to offer unique gifts that will bring joy and sanity to our new moms. You’ll understand after you read…. Newborns…they’re brand new. They are used to being in the womb where it is warm and cozy. The Miracle Blanket is a little gem most expecting mothers don’t know about. They are known to help with colic and help babies sleep longer and better, who doesn’t want that? Made with no buttons or Velcro, these are simple to use. A miracle blanket for your expecting friend is the perfect gift. She’ll thank you…again and again. The Bump Studio’s Lucy Darling stickers are the perfect gift. What expecting mother doesn’t want to showcase her baby’s adorable changes month to month? These stickers come in cute prints, whether you are buying for a girl, boy, or a surprise! They allow mom to document her baby’s monthly changes in the cutest way possible. Simply buy the stickers and some white onesies and you will have the most darling and thoughtful gift at the shower! Want to buy a gift for mom? We also carry monthly stickers for the mom’s belly! Watching the belly grow can be just as fun! Expecting mothers can be very sentimental, so tune into that with The Bump Studio’s memory book! This gift is sure to put a smile on her face at the shower. It isn’t the album she will look at, get overwhelmed, and throw into the closet. The book has a simple layout showcasing a variety of baby’s firsts, all mom has to do is add cute pictures and memories! You’re probably thinking, “Why didn’t I think of this”, yep we did too! This is a hands-down must for expecting mothers. You turn it on and it simply says SHHHHHH to your baby. It’s a genius idea, right? There really isn’t much to say, besides the fact babies love that loud sound; it automatically calms them. Mothers can take it on the go, hold it while rocking, or set it in the crib while baby sleeps. Take our advice and purchase this for that mother-to-be. When an expecting mother hears her baby’s heartbeat for the first time, her own heart skips a beat. The sound is like no other. Why not let her take that angelic sound with her? The Bump Studio can put that sweet baby’s heartbeat in an adorable stuffed animal. What a perfect idea for a sentimental gift. Expecting mothers have to give up a lot. Healthy, glowing skin should not be one of them. Visha Patel is a well-known dermatologist in the Memphis area. She created a line safe for women pregnant and nursing. The Bump Studio offers her Bump 2 Baby balm and Mommy Purifying cleanser. The balm is specially formulated to prevent stretch marks and moisturize skin safely while pregnant. Mommy cleanser is sulfate and paraben free and meant to be used twice a day to remove daily toxins. The cleanser balances the pH of skin and helps control those hormonal breakouts every mother hates. Zinc combined with fruit acids and vitamin B5 help decrease inflammation while refining skin texture. These are perfect gift ideas to help mothers pamper themselves, something that is well deserved! Finding out the gender of your baby is a magical moment. Why not help mom make it a fun surprise and an excuse to throw a party? 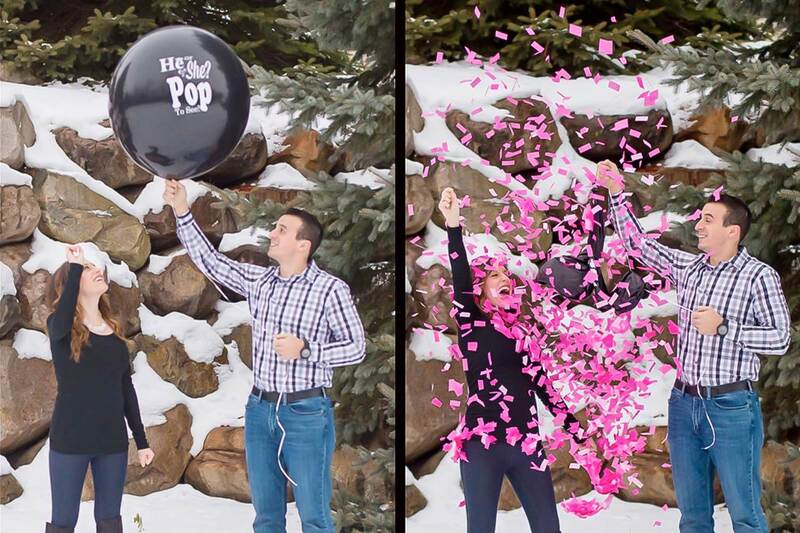 The Bump Studio carries a unique gender reveal balloon that would make an excellent gift idea for expecting mothers. It’s a huge 36” balloon prefilled with pink or blue confetti, has the cute phrase “He or She Pop to See”, and comes with a pin to pop. It’s simple and requires no work on your or her end, just bring to your local party store to be inflated. This is a fun gift that expecting mothers will always remember. Mom has carried that sweet baby for 9+months; and the bump has been the center of her focus. When the bundle of joy arrives, let her show off her miracle with our special onesie. With the words “Baby Behind the Bump” and year established, this onesie is a one of a kind gift idea!